Washington: Welcoming Egyptian President Abdul Fattah Al Sissi at the White House on Tuesday, President Donald Trump said his Egyptian counterpart was doing a “great job”. Al Sissi’s second White House visit was aimed at strengthening military and counterterrorism ties and securing at least tacit US backing for his planned remake of the Egyptian constitution. A compliant Parliament already has approved a rewrite that would allow Al Sissi to remain in power until 2034, and a national referendum is expected within weeks. 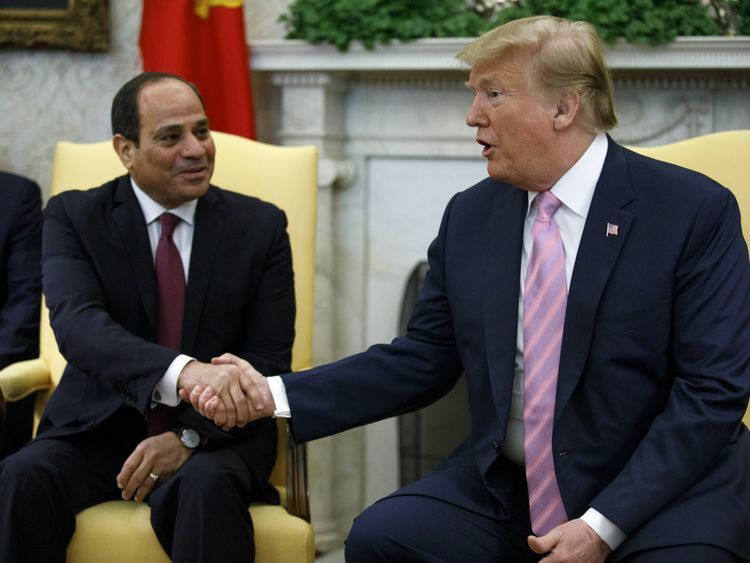 Trump, asked about what human rights groups call a blatant power grab in Egypt, said he was unaware of it. “I think he’s doing a great job,” Trump said amid the din of reporters shouting questions in the Oval Office. Al Sissi praised Trump and said “relations have not been better” between Egypt and Washington. Egypt receives more than $1 billion in US military aid annually, a figure Trump has not reduced despite his proposed slashing of the foreign aid budget. A White House fact sheet about the visit stressed Egypt’s role in promoting “Middle East stability,” noting cooperation in conflicts in Libya, Syria, and Yemen and in combating terrorism. Egypt, the first Arab state to make peace with Israel, is also seen as a key to a still-secret Israeli-Palestinian proposal drafted by Trump adviser Jared Kushner.